Image courtesy Ronald LU & Partners. 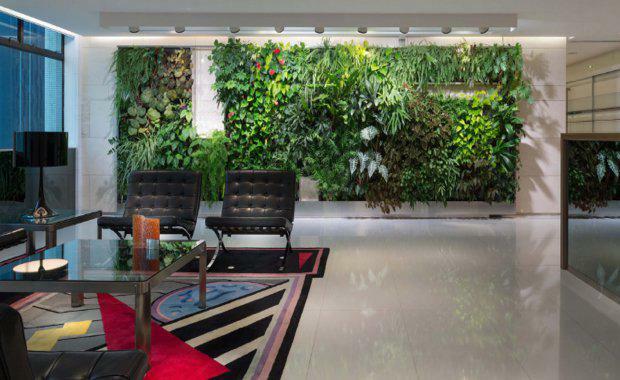 Employers, building owners, designers and developers throughout the world are showing that it pays to invest in greener offices that keep their occupants healthy and happy, a report from the World Green Building Council (WorldGBC) reveals. The new report Building the Business Case: Health, Wellbeing and Productivity in Green Offices highlights the global momentum behind healthy and green office design and operation, and showcases over 15 buildings from around the world that are leading the way. Australia has come out as a global market leader in the new report, proving healthy and green offices boost people, productivity, and boosts business’ bottom line. World Green Building Council CEO Terri Wills said the report presents overwhelming evidence between office design and improved health and wellbeing of workers. "This report breaks new ground by demonstrating tangible action businesses are taking to improve their workspaces. Simple steps like improving air quality, increasing natural light and introducing greenery - those which typically have environmental benefits such as using less energy – can also have a dramatic impact on the bottom line by improving employee productivity and reducing absenteeism, staff turnover and medical costs. The report is the latest to be released under WorldGBC’s Better Places for People campaign. The report said that Medibank’s new office in Melbourne is the centrepiece of a culture change programme for Australia’s largest health insurer. The plant-filled building includes 26 types of workspaces, from tranquil areas to collaborative hubs, fireplaces on every floor, edible gardens and sports facilities. Two in three staff feel healthier, 80 per cent are working more collaboratively and absenteeism is down five per cent. It is one of the several healthy buildings highlighted in regional spotlight, others include Lendlease’s International Tower, MacQuarie Bank and WWF Australia, all which are based in Sydney. The World Green Building Council also developed a simple framework to help companies take action. The framework issues a call to action for organisations to assess key environmental factors which affect health and wellbeing, survey employees to find out how they experience them, and measure the economic factors they influence, such as productivity, absenteeism and medical costs. 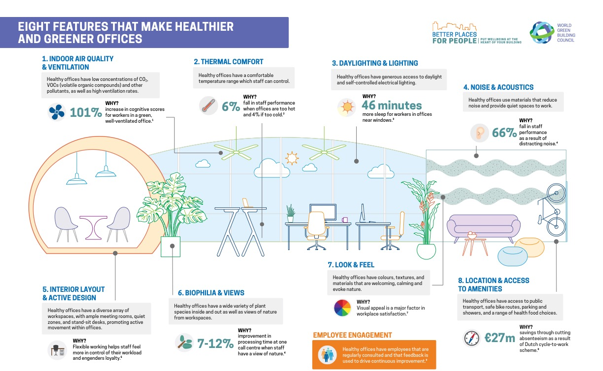 The report identifies eight key factors in creating healthier and greener offices which can impact on the bottom line. Location and Access to Amenities – a Dutch cycle to work scheme saved €27m in absenteeism.